These elephants have been through a lot of hardship in their lives, but the fact that they can open their hearts to a kind caretaker truly shows their loving character. According to the sanctuary, the woman named Lek has somewhat of a positive rapport with the elephant called Faamai and has been helping her get to sleep for years. 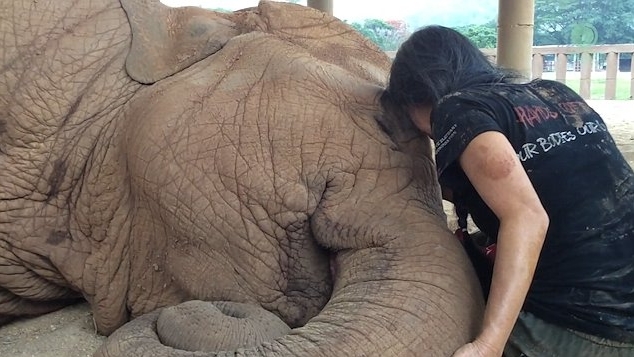 In the video, Lek begins singing softly while approaching the animal - which reacts by pulling her in for a hug with her long trunk. Elephants who are rescued and brought to sanctuaries have been through all sorts of troubles. Some have lost family members to the cruelty of ivory poaching and others have been rescued from an abusive life in the zoo, circus, or tourism industry. Whatever the reason, these elephants are without a doubt traumatized and are in major need of love and care. Which is why sanctuary workers tend to go above and beyond to make these animals feel safe. They give the elephants trunk massages, help them get used to walking, and of course, provide plenty of snuggles! 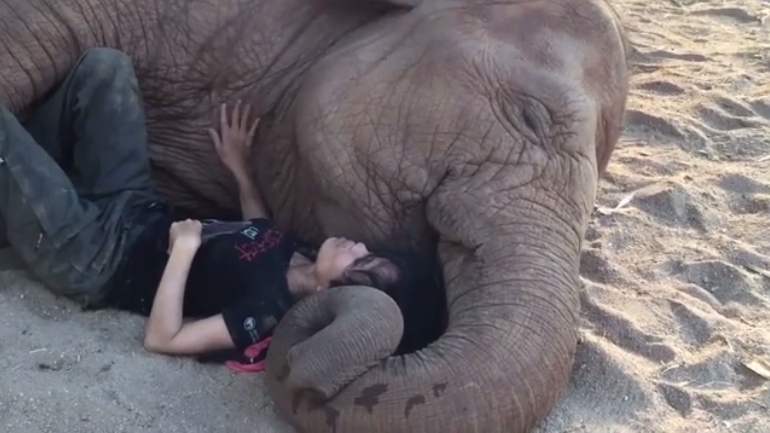 Responses to "Caretaker Snuggles Up With Rescued Elephant to Help Him Feel Safe "
<3 <3 Absolutely beautiful. What a great and rewarding job these rescuers have. It-s flapping it's ears w the drum!